Jay Pack started his industrial sewing equipment career in the early 1980's. He was fortunate to have the opportunity to work on thousands of various makes and models of industrial high-speed sewing equipment. With his unique background, he easily transitioned into embroidery machine repair. In 2004, he began repairing and maintaining the embroidery machines and related equipment at Campus Chalet located in Johnson City, TN . Campus Chalet and owner, Ed Dance, is well known in the embroidery industry and is one of the largest embroidery facilities in the East. 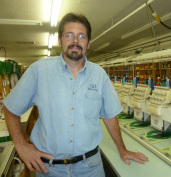 In 2006, Jay became an independent embroidery repair technician and founded J & S Maintenance and Repair. With a degree in Electrical Technology, Jay has a clear understanding of the electronic/electrical systems and is fully qualified to service your equipment. We have currently expanded our business- please see our service area map.